New submissions for our Glossary of Confusing Words! This week we're defining "institute" and "underway." Unfortunately the people who suggested these terms didn't leave their email addresses, so we can't thank them personally, but they'll know who they are, so here's a public thank you to them. Anonymous suggestions are still welcome suggestions. "School or research group?" asked the person who suggested we define "institute." You'll hear the word institute in the titles of some things related to American universities - the Massachusetts Institute of Technology, the Georgetown Health Policy Institute, etc. (1) Most commonly, “institute” is used to describe a research group or think tank. Sometimes these are housed within or affiliated with a university. They don’t offer classes, but they probably offer seminars and internship opportunities for students. The Georgetown Health Policy Institute is a group of faculty and staff of Georgetown University who conduct research on health policy. The Quinnipiac University Bioanthropology Research Institute is housed within Quinnipiac’s School of Health Sciences and conducts research in various fields of biology and anthropology. 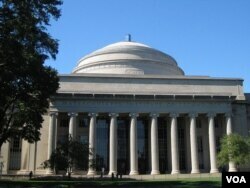 (2) Institute can be used in the name of a university, and in that context is just a synonym for “college” or “university.” The Massachusetts Institute of Technology (better known as MIT) is one example of this. (3) Institute can be used in the name of an academic department, and would describe an area of study you could major in. For example, the Johns Hopkins Institute for Policy Studies is an academic department with the Johns Hopkins University. The second word suggested was "underway." It's a word you might come across in official communications from a university or on their website; for example, "The financial aid process is underway," or "renovations on the new building are underway." It means "currently in progress" and is often used when people were waiting for something to start. So, “the application process is underway” means the application process has started and is currently ongoing.